Most professionally managed funds in the Forex markets operate using systematic long term trend following models. Long term trend following is one of the most robust trading models with a track record of many decades and utilized by some of the worlds most successful fund managers and traders. 1. Market selection: the number of currencies they are trading, and the correlation between those currencies. 2. Stop placement and exit strategy. 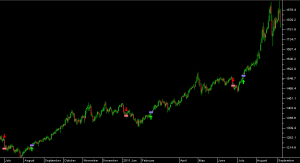 Closer stops reduce holding period and reduce trade win %, wider stops increase holding period and improve trade win %. Cover short positions and buy long whenever the price exceeds the highest high of the previous 4 calendar weeks. 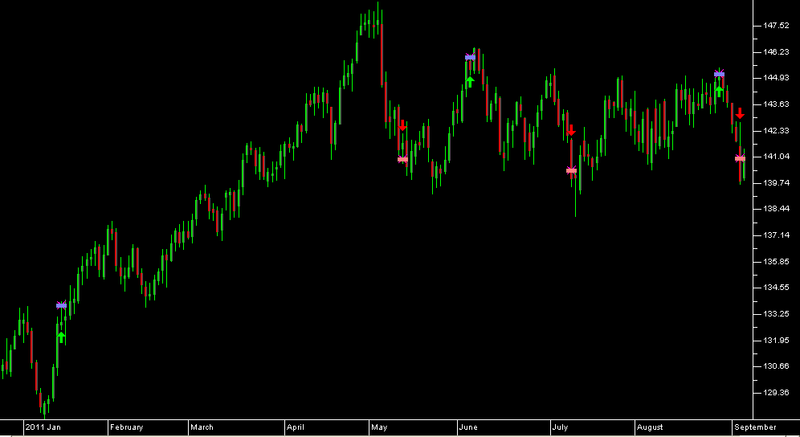 Liquidate long positions and sell short whenever the price falls below the lowest low of the previous 4 calendar weeks. Even though Donchian 4 week rule was released over 40 years ago it has continued to perform well across a well diversified basket of markets through to today. 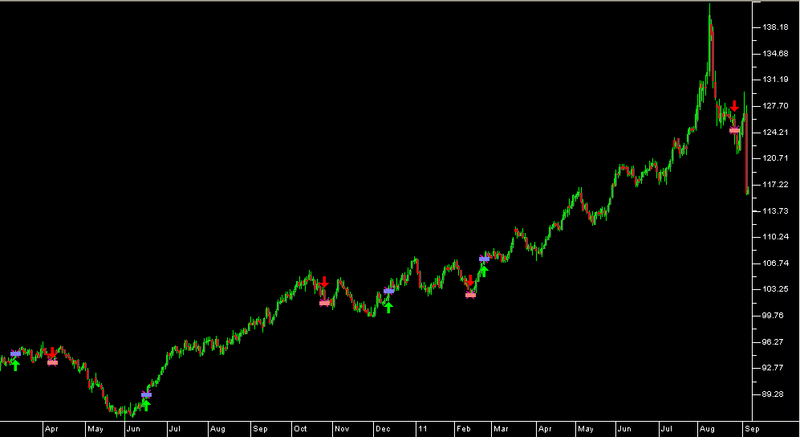 Below is a chart of Swiss Franc showing recent trade entries and exits using the Donchian 4 week rule. 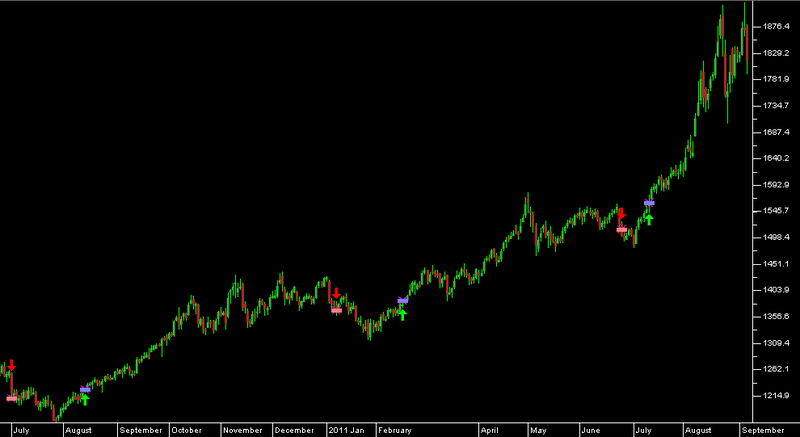 Below is a chart of Gold showing recent trade entries and exits using the Donchian 4 week rule. One of the problems that plauge trend following models is market ‘chop’: the extended periods when markets are not in trending mode. It is quite common to see individual markets go for months and sometimes years without any decent trends from which to derive profits. 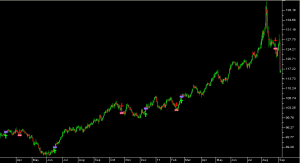 Below is a chart of Euro currency showing recent trade entries and exits using the Donchian 4 week rule. How can trend traders prevent being ‘chopped’ during trendless periods? Most important is to practice sound money management and to create as much diversification in a portfolio as possible within the bounds of any capital constraints. There is normally at least one market trending at any one time which helps cover losses in other markets which are exhibiting trendless behaviour. Many forex brokers such as Oanda offer bet size down to one unit making it possible for even the smallest account holder to achieve reasonable portfolio diversification. Diversification is achieved by trading as many uncorrelated markets in a portfolio as possible. Remember when making any correlation assumptions that uncorrelated markets can and frequently do become highly correlated during times of market duress. Secondly it is important to trade multiple time frames: it is quite common for one time frame to experience chop whilst other time frames are performing well. Extremely long term trend following systems (breakouts of multi year highs / lows with multi month exits) may be performing well while 20 day high / low breakouts are experiencing chop and vice versa: Trading two or more uncorrelated system parameters together helps smooth portfolio equity. Fast parameters tend to be more susceptible to random market noise as entry and exits get triggered by less significant market events. Smaller time frame traders using tight stops typically employ ‘trend filters’ to reduce the impact of counter trend chop. 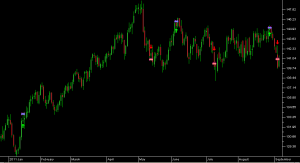 For very short time frame traders (<1 to 5 day holding period) scale out profit targets help in reducing draw-down.